Beauty Tip: Dark Under Eye Circles Remedies? | misskatv.com: Beauty Tip: Dark Under Eye Circles Remedies? Beauty Tip: Dark Under Eye Circles Remedies? Most of us are dealing with baggy and dark under eye circles. Unfortunately, there are no symptoms to this problem. Ageing can be a factor for the main development of under eye circles and stress is also a common cause for this. Here are some of what I noticed from myself that causes me to get under eye circles. I know it's kind of inappropriate for my age but ageing is still considered on this part. And here are some of the remedies that I do for myself and hope it works for you as well. Typically, under eye circles are purple-ish or green-ish so what you wanna do is use either yellow/goldy or pinky shade concealer. First, check if you have purple-ish or green-ish under eye circles. As you can see in the color wheel, the opposite color for purple is yellow. Same with applying make up. 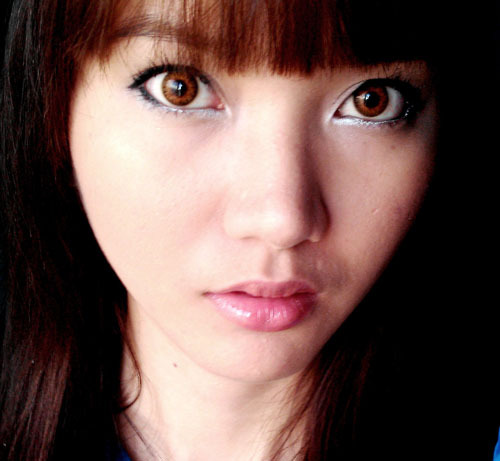 Purple-ish under eye circles can be corrected with yellow toned concealer. With green-ish under eye circle it's much better if you conceal it with more of a pinky color. It is best to apply concealers with your fingers. Why? The heat of your fingers melts the concealer and helps it to blend with your skin really well. You can purchase this palette from Dollface cosmetics but I recommend to buy a single shade concealer that matches your skin. You don't need this much if you can't use it all right? They are also selling individual concealers here. 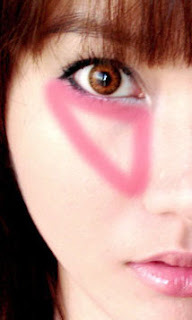 Make sure you apply it under your eyes in triangular area as seen in my photo. Blend the lower part with your skin to make it look natural and powder it really well. The powder helps your concealer stay long, especially if you get sweaty. Your skin may absorb your concealer if you don't set it with powder. You don't have to go buy special products for this, your just need a good concealer. :) I use Maybelline Mineral Power Concealer in Cream. My aunt used to to this, apply 2 thin slices of cucumbers on your eyes for 15-20 minutes. This can relieve stress and refreshes you eyes. Make sure you get 8 hours of sleep daily. It is very important that you sleep without being disturbed at all. This is not only good for the eyes but also for the body as you will not have any health problems in the future. Consume at least 8 glasses of water a day. Consume meals that are rich in protein, vitamins and minerals. Like fruits and vegetables. Cold tea bag on top of each eye for 10-15 minutes a day. It's much better than using ice. Ellen suggested to use Garnier eye roll on. @DEBI: Added your tips in my post! tagged you also. :D thanks for sharing! Thanks for sharing! :) how about Garnier eye roll on? btw, I sent a follow request on your twitter. :) hope you will follow me too. :) have a nice day! I hate dark circles under the eyes. So glad concealer exists! I have dark circles and I think it can also be hereditary! THANKS FOR THE TIP. (: It's been a while since I've been on blogger, I much catch up with your blog! very helpful entry... but I just don't know though hoe to identify whether I have greenish or purplish eye circles. :| any suggestions? thanks for following my blog. your post here is very interesting and informative. 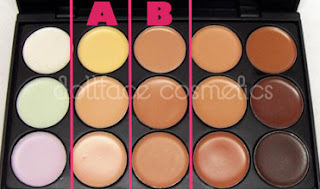 i am not very good in applying concealers as I don't often use it so this post is really helpful especially for noobs like me hehe LOL. thanks again! will be following your blog too. Now I know what to do :) thanks for sharing this. Hi!Thanks so much for following my blog.I love your site!Very informative and truly interesting. Looking forward to reading more of your posts. Will try some of them soon! :) Cool tips! Btw, your blog is so cute! Fantastic post! I'm always trying to conceal my under eye circles- thanks for the tips! I'll def be comparing the colour of my circles against the colour wheel- you're so smart! Following you because you're awesome! : D That was helpful~ Having a concealer palette would be so awesome. >w< Also another person named Kat! yehey~Hello. Oh I wish there was something you could do about fine lines though oAo the usual methods don't seem to get rid of them buu. Undereye circles- anything cold helps. Cucumbers are useless unless they are cold. That is the biggest myth in the skincare world. Unless you have a concentrated serum with cucumber in it. Caffeine infused eye creams help. Keep hydrated! love this love this love this.. Please reply back as I'm trying to create my own website and want to learn where you got this from or exactly what the theme is called. Cheers!